There are a few things I always pay attention to when reading any book. If it happens to have an interesting title, one of the things I keep an eye out for is the passage where the title originates. 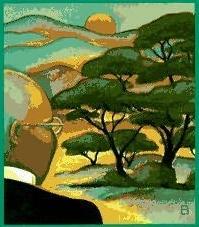 Alan Paton's Cry, the Beloved Country was a book that had spent a few years on my bookshelf before I finally cracked it open. And I'd always wondered where that particular title could have come from. Certainly not in dialogue- people just don't talk that way. And it didn't sound like any sort of standard narrative description, so what then? Maybe a song? A Poem? I just didn't know. Turns out it comes from Paton's use of intercalary chapters to tell his story. Intercalary chapters are simply passages that are inserted in between various sections of the narrative to expand the scope or provide context for the central characters and their story. Rather than disturb the flow, they're meant to create a mood, or show flashes of what's happening in the larger world. In Cry, the Beloved Country, intercalaries are used to cast Stephen Kumalo's story against the backdrop of percolating racial tensions in South Africa, and against the ruthless gravitational pull that large cities seem to exert on the rural poor. But I'm not alone in thinking it's a great title. There's an interesting story about how this exact passage was chosen. Paton was staying with two acquaintances in California, on the condition that they read his manuscript. When they finished it they asked him what he would call it. He suggested that they have a little competition. Each of them would write their own proposed title, and then they would compare notes. When they showed each other their suggestions, all three of them had written "Cry, the Beloved Country." I don't like the title. But I love the book.